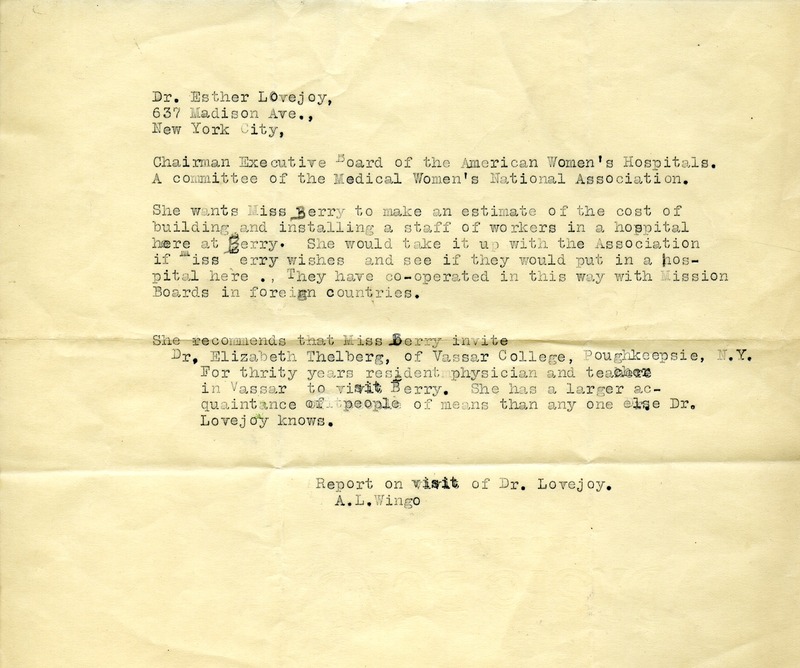 Alice Wingo's report notes that Dr. Esther Pohl Lovejoy recommends that Martha Berry estimate the cost of building a hospital at the school which Lovejoy could present to the Medical Women's International Association for funding. Lovejoy also recommends seeking the support of Vassar College Physician Dr. Elizabeth Burr Thelberg. A. L. Wingo, “Report on the Visit of Esther Pohl Lovejoy.” Martha Berry Digital Archive. Eds. Schlitz, Stephanie A., Sherre Harrington, et al. Mount Berry: Berry College, 2012. accessed April 20, 2019, https://mbda.berry.edu/items/show/3619.